After four high-octane series’, the four victors claimed their spots on the ladder going into the final week before playoffs. Avant Garde came into this game with something to prove after taking a game off Order and giving up a huge lead in another game the previous week. After letting a huge upset victory slip through their fingers, head coach Pinch and his team would have been confident in their ability to take anyone down. Dire Wolves had not dropped a series this split, but dropping a single game to the Bombers might’ve suggested they’d be vulnerable to an upset. If Avant Garde were to take the series, they’d be relying on Jungle and Top duo Praelus and Pabu to work together to starve Dire Wolves star Jungler Shernfire of resources to take him out of the game. Avant Garde’s bot lane kicked off OPL Week 9 playing aggressive early and forcing a flash, but a Sleepy Trouble Bubble from Triple was all it took to swing the next fight in the Dire Wolves favour and secure them three early kills. Avant Garde persisted in fighting bottom, finding a kill on Cupcake with some help from a Cannon Barrage. Pabu’s luck ran out shortly after, eventually getting solo killed by BioPanther. A three for three skirmish was enough to slow down the Dire Wolves for a while, allowing Avant Garde to slowly rotate around the map and trade turrets. But, eventually, the Dire Wolves grouped up and began to move around the map as a five-man squad. After finding the pick, they began a genius Baron bait that found three members of Avant Garde dead. Dire Wolves took the Baron, Dragon and an inhibitor. After finding a useful couple of pick-off kills, the Dire Wolves were able to group and seige Avant Garde’s base for the game. After a slow start to game two, Triple solo killed Frae. A very similar skirmish to game one transpired in the bot lane early and, like game one, the Dire Wolves came out of it with three kills. After Triple and Shernfire had finished wreaking havoc on their midlane, Avant Garde once again decided to persist in starting fights on the bot side. Avant Garde found themselves three kills, but gave up four. The Dire Wolves slowed down the pace of the game and used their lead to siege; Avant Garde couldn’t defend their turrets against a Syndra with no frontline. Strange flashbacks of game one continued, as Pabu found himself caught out by BioPanther in the bot lane, before the Dire Wolves once again secured a Baron in vision. This time they made no mistake, taking down four members of Avant Garde in the river after the buff had been secured. The Dire Wolves had no trouble marching down top lane with their Baron buffed minion wave, taking the inhibitor and the life of Frae, to end the game. The Chiefs were sitting comfortably in second, but wanted to start putting the teams placed before them to the sword, as they prepare for playoffs. If Legacy were to keep their own playoff dreams alive, they were going to have to take this series 2-0. Despite being 4-4, they were placed sixth behind the 2-6 Bombers and the 3-5 Mammoth Esports. That was because Legacy have consistently won their series’ 2-1 and lost their series’ 0-2. A 2-0 victory would’ve seen them jump to fourth in the standings. All four summoner spells in the midlane were blown three minutes into the game, before Claire and ry0ma traded kills. ry0ma was able to take Claire down first, however, securing first blood for the Chiefs. Claire is then caught out and taken down while warding, giving the Chiefs ample opportunity to take an uncontested dragon. Legacy looked like they responded well, countering a vital gank that could have swung the game in the Chiefs’ favour. They were able to secure the Rift Herald but lost the race for first tower gold. Legacy grouped up and started looking for a fight while taking control of vision in the Chiefs’ top side jungle, but a perfectly placed Equalizer from Swip3rR was all the Chiefs needed to turn on the aggressors. Legacy lost three members and two turrets. The Chiefs strutted into the river with a healthy gold lead to set up a trap for Legacy in the Baron pit. Legacy took the fight and lost, allowing the Chiefs to find their Baron. Not before long, waves of Baron buffed minions were crashing into Legacy’s mid and bot inhibitors. While their base was under siege, Legacy members started dropping like flies and The Chiefs ended the game in convincing fashion. Legacy got off to a much better start than game one, with Only and Mimic able to combine and get themselves the first three kills. Legacy continued to play through top, taking the first turret top side and the Rift Herald. The Chiefs took the Mountain Drake as a consolation prize. The Chiefs rested and started their mid-game movements, finding two kills roaming around Legacy’s side of the map. The next two skirmishes could have easily fallen in Legacy’s favour, but ry0ma on the Aatrox was able to swing fights in his team’s favour so quickly with his crowd control, immense damage and ability to dive the back line. Legacy found themselves on the back foot, spotting the Chiefs in the Baron pit all too late. Babip gave his life to allow the rest of his team to escape and base with the Baron buff. Raes and Destiny were caught pushing too far, and Mimic looked to punish them. But, once again, the presence of the Aatrox is able to salvage a fight that should really have gone Legacy’s way. The last time these two teams met was early in the season, with Tectonic taking Order down in a convincing 2-0 victory. But apart from a miracle 2-0 victory over The Chiefs, Tectonic had looked like the weakest side in the league, showing glimpses of brilliance all too rarely. Iconic Mid laner for Order, Swiffer, had been quiet lately, absorbing map pressure from enemy junglers and letting his jungler and bot lane run rampant on the enemy. If Tectonic fell into the trap of putting too much time into Swiffer – ignoring the Order bot laner FBI, Order were going to run away with the win. FBI got the perfect start to the series, capitalising on a questionable engage from Trance with the help of a tongue lashing from Rogue. UDYSOF fell into the classic Order trap of trying to camp Swiffer, understandably as no one wants to be the first team to get rolled by the new Akali. However, Tectonics absence in the bot lane let FBI and Rogue push in their wave and chip down the enemy bot tower to about 10 per cent before Value reached level six. UDYSOF was quick to respond, helping his botlane get a kill back from Order in Rogue. But the blue-side bot tower was too low and fell to the next wave. Anderu had been keeping up with Swiffer well, the botlaner had to step in for Shok who had fallen very ill.
That was until Swiffer landed a whole combo onto the Oriana and solo killed Anderu, 100 to zero. Meanwhile, Praedyth was able to give Tally the same treatment, tieing up the kills yet again. Tectonic kept up in kills but Order were always two steps ahead in map rotations and were able to keep sieging under Tectonic’s nose. Swiffer found himself another two 100 to zero solo kills on Anderu, setting up his team to take the first inhibitor. At that point, Order had taken down seven turrets and Tectonic had taken down none. Order strolled through the river to secure Baron Nashor, and ended the game after demolishing every last structure left in the Tectonic base. Swiffer and Spookz were quick to punish the off-role mid laner in game two, forcing his flash and taking his life at the two-minute mark. Spooks re-ganked and found kill two on Anderu in as many minutes. Tectonic learned from their mistake in game one and gave all of their attention to the bot lane early, trying to keep FBI from getting ahead. Tectonic were able to find kills in the bot lane, keeping Order from running away with the game. They kept skirmishing and gave themselves a kill lead, but lost five turrets in the process. Not only that, all Order’s high damage composition needed was gold and it wasn’t long before Tally and Swiffer were monstrous. Once their waves were sufficiently pushed, the Tahm Kench ultimate was used to rush the Baron down for Order before Tectonic knew what was going on. Order’s damage was too much for Tectonic to step forward and defend, they were left in the fountain watching their base crumble. Over the previous three weeks, the Bombers had games off Dire Wolves and Legacy Esports, as well as notching up their second 2-0 series victory. A switch had flicked and the Bombers had become a formidable team-fighting team, and had found success playing through their bottom lane – whoch has impressed in Split 2. Mammoth had been creative this split, experimenting with picks in the bot lane. Their North American bot laner Mash made Smite-Karthus his pocket pick and had found success on bot lane mages. The game was going to be won or lost for both sides in the bottom lane. It was up to the draft and the junglers of either side to set their bot lane up for victory. The Bombers put themselves into the driving seat of game one immediately. Tiger and Looch found themselves lane kills off the back of aggressive trading and pushing their lanes. Mammoth couldn’t respond in any significant way. Sleeping pushed Chippys under his turret and started to roam, assisting Seb in applying map pressure. Juves was caught by the pair in his own jungle and got taken down. Despite the aggressive plays and rotations, the Bombers lead was only 2000 in gold. 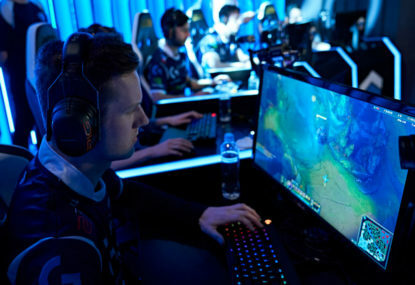 But they persisted in skirmishing and picking off Mammoth players – finding themselves in the mid-game with a significant lead. Mammoth were finally getting choked out of the game, being forced to farm from their base with five of their turrets taken. Once the Bombers extended their lead to 6000, they headed straight to the Baron, intelligently baiting Mammoth and waiting for them wander into the river. However, they spotted a backing animation and took the opportunity to burn down the Baron. They then performed an impressive siege, pushing forward and disengaging cleanly – heading back to base with two kills and two inhibitors. The Bombers only needed one more push to win the game as Mammoth had no answers. Chippys started his game off how anyone would expect him to on his pocket pick, Camille. He blew Sleeping’s flash level two and dived him with Juves the very next wave. Seb was quick to respond on top side, counter tanking another attempt on Sleeping’s life and forcing Chippy’s flash. Seb and Juves revisited the top side eventually and the top laners traded kills. Looch and Tiger once again were playing aggressively, taking small farm leads and pushing in their lanes. Tiger ended up taking the bot tower, but lost the race for first turret to Mammoth after they won a fight top side. Mammoth built tempo, using the Rift Herald to siege mid, and used their momentum to fight around the map until they were confident enough to take the Baron. Mammoth mimiced the Bombers’ final siege in game one, playing a patient and disciplined siege. But once a pick was found in the base, Mammoth were able to quickly burn down the nexus and take the series to a game three. Starting more like game two than game one, first blood came from a scuffle on the topside. This time, the Bombers secured it and traded back a kill. Sleeping pushed in his wave enough to sneak the Rift Herald with Seb, but was caught out on his way back to lane. The Bombers tried to find more kills around the map, but gave back as many kills as they got. Their erratic and persisting, pushing and rotating did end up finding them the lead they wanted, taking three turrets to Mammoths one. Map control saw the Bombers find the fights they were looking for, picking off one Mammoth member after another. A series of kills around the rift gave the Bombers enough tempo to secure the Baron. Looking back at the trend of Barons in this series, Mammoth didn’t look long for this world. Eventually the buff wore off and the action subsided until another Baron spawned. The Bombers took four members of Mammoth in the pit after a fight broke out in the river. The Bombers teleported right into Mammoths’ base, ignoring Baron Nashor, taking the enemy nexus and the series.